Canvas Day Pack Woodland Camo | BUDK.com - Knives & Swords At The Lowest Prices! Rothco's Canvas Day pack is constructed of heavy-weight cotton canvas for a sturdy pack that will go wherever you go. 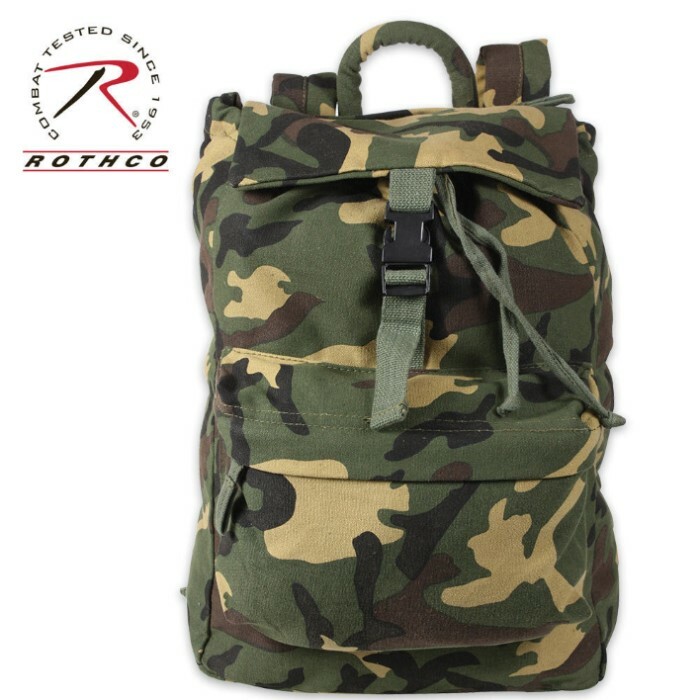 I like the light weight material but this knapsack does not close like a normal one. It has a drawstring to close and the cover and top flap is a bag. So it doesn't close properly if you put a lot of stuff into the sack. You cannot see this on the picture of the knapsack and it's not worth sending back and pay for the postage. Keep this in mind if you decide to order this knapsack. this thing is great. its able to fit most of my things i bring to the woods in it. when i first got it i thought it might be too small but soon realized that it was just right.